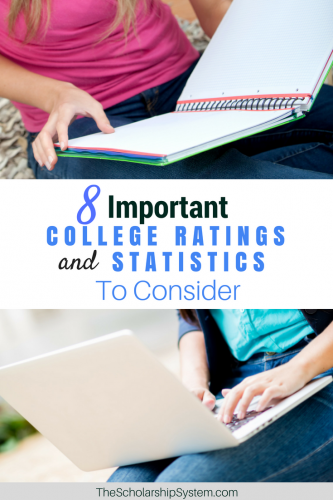 As your child continues their college search, it is vital that they review the right college ratings and stats. And, no, not necessarily the “best colleges” rankings that come out every year. There is a range of college ratings and statistics that many parents and college-bound teens accidentally overlook. However, by taking the time to dig into these numbers, they can discover interesting facts about the schools they are considering, potentially narrowing down their list of viable options. Some college ratings and stats need to be taken with a grain of salt. However, they are all worth looking into before your child makes a final decision about where they want to go to college. Six-year graduation statistics are college ratings that tell your student how many first-time, full-time students who pursued a bachelor’s degree at the school actually completed the program within that time frame. And, the higher that number, the better. Typically, if students aren’t happy with the school, they aren’t going to get their degree. Additionally, if the cost of tuition is high, some may not be able to afford to continue, leading them to drop out. While no school will have a 100 percent six-year graduation rate, a low number should be a warning sign. For example, City University of New York (CUNY)’s College of Technology has a six-year graduation rate of only 30 percent, which certainly qualifies as poor in comparison to other college ratings. One of the other college ratings that provides you with valuable information is the returning sophomores statistic. This lets your child know how many people decide to come back for the next academic year after completing their freshman year at the school. Again, this is one of the college ratings where higher numbers are better. Dissatisfied students probably won’t come back, so low numbers are a troubling sign. A degree isn’t helpful if it doesn’t help your child land a job, making this an incredibly important college stat. However, tracking down this information can be challenging, and your student needs to view the data in the proper context. Many schools display these college ratings on their websites, touting how many people have employment after they finish their education. However, some of these values are inflated by professionals who were already working and chose to get a degree at the same time. Inflated numbers may be more common at online schools that provide flexible schedules, as many working professionals can earn these degrees outside of their work hours. Additionally, some colleges don’t clarify if the graduates actually got a job in their field, or if they simply had to settle for something else. For example, a school might count a person as employed after getting their degree in a field like accounting even though they got stuck taking a job in a fast food restaurant. While your student should review this information (typically in the college’s About Us section or under the Facts and Figures heading), they need to read the fine print. It is also wise to compare the information with other sources. For example, The Princeton Review maintains a list of schools with the best career placement. And they don’t just take a school’s word when it comes to assigning them these college rankings. Instead, they review student ratings based on the college’s career services and combine that with salary information on PayScale.com. The default rate tells your child how many students who attended that school ultimately defaulted on their loans. Lower default rates suggest that those who attend the college are able to secure employment, allowing them to repay their debts. It could also suggest that the costs of getting an education there are more reasonable, as smaller loans are easier to pay off. Ultimately, these college ratings can be incredibly helpful, especially in conjunction with job placement data, as it allows your student to determine if they are likely to be able to repay their loans after getting a degree. One easy way to review this information is through Default Rate Search offered by the Department of Education. Salary information should play a substantial role in your student’s college search process. While these figures aren’t technically college ratings, they are important stats, and the data is incredibly valuable. When your child starts looking at the numbers, they need to head to the right sources. For example, the Bureau of Labor Statistics has a wealth of information about jobs, including pay ranges, required experience, and if you need a degree. They also have job growth projection data, letting your student know if demand is growing in their ideal job area. Resources like PayScale, Glassdoor, and Indeed also provide helpful information about salaries. Certain majors have substantially higher unemployment rates associated with them than others, even though unemployment is only around 3.9 percent as of May 2018. Surprisingly, some of the riskiest majors are even in STEM fields, showing that no career is guaranteed. Some of the hardest hit majors include environmental science, anthropology, mass media, fine arts, communication technologies, and biology. In contrast, other majors have very low unemployment rates. Teachers typically fair well, particularly those in social science, history, special education, and language. Nurses don’t tend to struggle when it comes to finding a job, as well as those majoring in areas like natural resource management, animal sciences, and biochemical sciences. Attending a school with a diverse student body can provide a number of benefits. Your student will be exposed to different cultures and people from varying backgrounds, letting them experience new perspectives and ways of thinking. When it comes to diversity, there is no magic number that represents the right mix. However, an overly homogenous student body may mean your child misses out on a chance to learn from other students in a completely new way, ultimately broadening their horizons and allowing them to see things in a different light. The College Board tracks student body data on their website. All your student needs to do is search for a school, select the Campus Life section, and look under the Student Body tab. While this may seem like a strange statistic to include, it doesn’t hurt to take a look. Some people under or overestimate how hot or cold it is in cities with which they aren’t familiar, so reviewing this data is smart. We actually recommend students to schedule college tours during the “worst months” of the year so they can get a feel for the weather. Sounds crazy but put this southern girl (yes, I live in the south!) up north during January and February and my chances of going to class at 8 AM PLUMMET. At a minimum, it can help your child make sure they plan properly for the weather, bringing the right clothes, blankets, and other items to stay comfortable. After all, it’s hard to study if they are shivering or sweating day in and day out. Ultimately, all of the college ratings and stats listed above can be valuable, giving your student a more complete picture of what each school actually has to offer. In some cases, what they discover may lead them to remove a college from their list, or make one a higher priority. College searches can be challenging, but data can remove some of the mystery. Encourage your student to review all of these college ratings and see if they don’t feel better informed in the end. Lastly, once you’ve narrowed down the list, you will want to understand what this means for your checkbook. If you’re looking for a way to compare the colleges your student is considering, download our free Ultimate College Cost Calculator (and Comparison Workbook)! The post 8 Important College Ratings and Statistics to Consider appeared first on The Scholarship System.